Making Paper Greeting Cards That Are Easy and Gorgeous! Wow, right? I am almost embarrassed to tell you how ridiculously easy this card is to make. And it's all due to the paper – I love it and I only recently ordered it for myself – what was I waiting for? The catalog really doesn't do it any justice in showcasing how truly awesome it is. 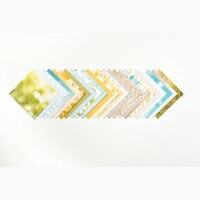 This paper is from the Serene Scenery Paper Stack and there are 4 each of all of the 6″ X 6″ sheets in each stack. I started with the whole sheet and cut it at 4″ wide. Then cut off 3/4″ at the bottom. This will leave you with a 4″ x 5-1/4″ panel and a 3/4″ x 4″ strip. Since most of the paper from SU is double sided, when you flip over the 3/4″ section, you have the green and white polka dots – that strip now will perfectly support your sentiment so it doesn't get lost. And can we talk about that sentiment? I was so excited when I realized this ONE stamp said everything I was thinking. Stampin' Up! is REALLY stepping up their greetings game!